We will also learn how to solve word problems involving perimeter of polygons. The perimeter of a polygon is the sum of the lengths of its sides. It is the distance around the outside of the polygon. See also area of circles, circumference of circles. 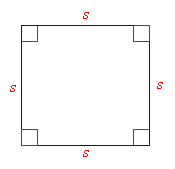 Since the sides of a square are equal, the perimeter of a square is 4 times the length of its side. A rectangle has four sides, with opposite sides being equal in length. where l is the length and w is the width of the rectangle. Worksheet 1, Worksheet 2, Worksheet 3 to calculate the area and perimeter of rectangles. Similar to a rectangle, a parallelogram has four sides with opposite sides being equal in length. where l is the length and w is the width of the parallelogram. where a, b and c are the lengths of each side of the triangle. A rhombus has 4 equal sides, so the perimeter of a rhombus is 4 times the length of its side. where a, b, c and d are the lengths of each side. How to find the Perimeter of a Parallelogram? How to find the Perimeter of a Trapezoid? How to find the perimeters of rectangles, squares, triangles and other polygons? 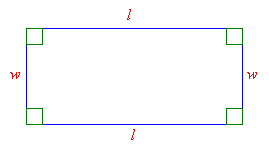 A rectangle is three times as long as it is wide. If the perimeter is 62 cm, what is the length? The width of a rectangle is 6 cm less than the length. If the perimeter is 52 cm, what is the width? The length of a rectangle is 7 cm more than 4 times its width. It perimeter is 124 cm. Find its dimensions. The width of a rectangle is 4 ft smaller than 3 times its length. Its perimeter is 144 ft. Find its dimensions. A rectangle garden is 2.5 times as long as it is wide. It has a perimeter of 1.6 feet. How long and wide is the garden? The perimeter of a triangle is 26 cm. The first side is 6 cm shorter than the second side. The third side is 2 cm shorter than twice the length of the first side. What is the length of each side?